What Can a Business Do if Its Copyrighted Material Has Been Copied by a Competitor? Copyright law protects your work against being copied by a competitor. However, protection is not absolute. If your competitor has copied your work, you must first determine whether the act counts as infringement under copyright law. 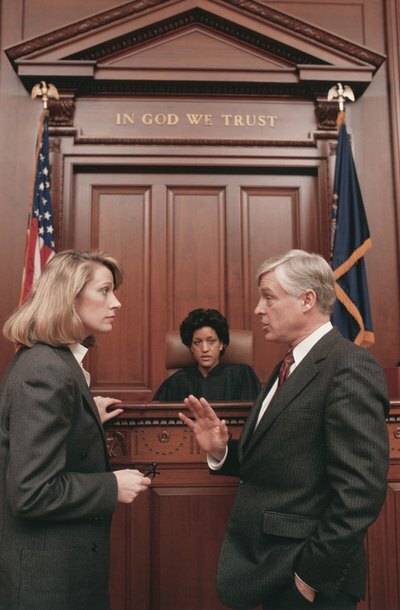 Before filing a lawsuit, it could be advantageous to send a warning letter. Copyrights protect expressions of ideas rather than ideas themselves. You can't copyright information, for example. Your expression must be original and tangible. Telling a story won't copyright it, but writing it down or putting it online will. Your work doesn't have to be registered or published to enjoy protection. If copyright protection applies, you enjoy a monopoly on the reproduction, distribution, modification, public performance and public display of your work. Limited exceptions apply, however. Under the fair use exception, for example, anyone can use a small part of your work for certain purposes. This exception is less likely to apply if your competitor used your work for commercial purposes. If you determine that your copyright has been infringed, you might send your competitor a "cease and desist" letter. In court, a judge may increase your damages if infringement was intentional, and it will be difficult for your competitor to claim unintentional infringement for any act that occurred after it received a cease and desist letter. A cease and desist letter simply identifies the copyrighted material, identifies the copyright owner, describes the acts of infringement, demands that it stop, and threatens legal action if infringement continues. Although you don't need to be a lawyer to draft such a letter, you might have a lawyer send it on your behalf. Generally, you must register your copyright before you can file an infringement lawsuit. Even if someone infringes your copyright before it is registered, you can still register your copyright after the infringement and will be afforded many of the same protections as if you had registered it before the infringement took place. You can register your copyright with the U.S. Copyright Office by completing a simple form online and paying a small filing fee for each work you want protected. If you qualify for statutory damages, you can claim up to $150,000 per act of infringement without even having to prove your losses. You can also claim attorney's fees, which can be very substantial in complex cases. If you registered your copyright too late to qualify for statutory damages, you can still claim any losses you can prove, plus any extra profits made by your competitor. Whether or not you qualify for statutory damages, you may seek other remedies such as an injunction against further infringement and seizure of any illegal copies of your work. A copyright gives you legal protection over a work you created. Copyright protection extends not only to works of authorship such as musical compositions and novels, but also to software algorithms. The U.S. Copyright Act provides a variety of legal remedies that you can use against copyright infringement including injunctions, civil damages and statutory damages. Although you don't have to register your copyright in order to have grounds for an infringement lawsuit, prior registration confers significant legal advantages. Why Should I Copyright My Thesis? Copyright protection of your thesis exists once you've written it -- you don't necessarily need to do anything more. The copyright for your thesis will last for the length of your life plus 70 years. Determining whether you should take the additional step of registering your thesis’s copyright depends on several factors.